For the last three years her focus has been on creating engaging online art classes, where she teaches and also presents well-known guest artists. She made this Paper Doll tutorial in anticipation of her next online class, “2014: Year of the Fairy Tale,” which begins January 20, 2014 and looks awesome! If you have any interest in illustration or know anyone that does definitely pass the info along. 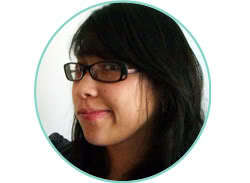 You can find out more about Carla and her art and classes at Carla’s Blog . Here’s Carla! 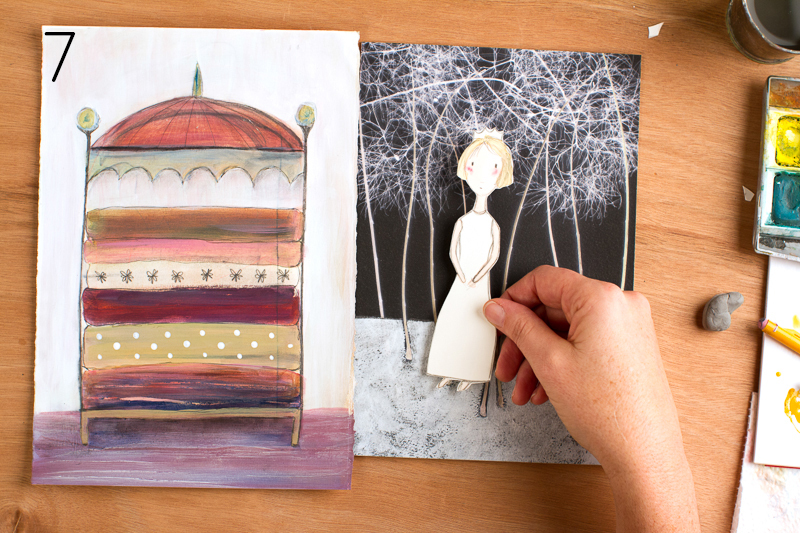 Here is a quick and fun way to make original paper dolls… a perfect thing to do with your kids or to nurture the kid inside you… because we’re never too old to play with paper dolls! Have fun! 1. Gather your supplies. 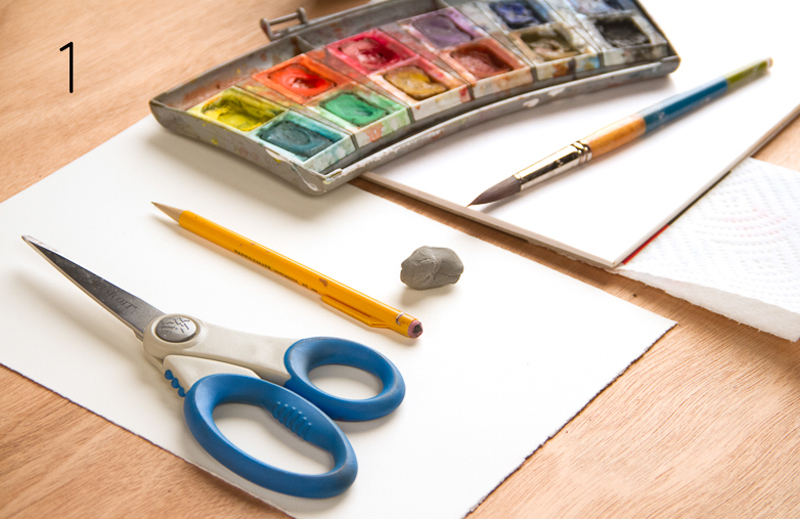 You’ll need a small watercolor set, a #12 round paintbrush (or similar), a piece of 8″x10″ hot press watercolor paper 140# (or similar), a pencil, an eraser (I like kneaded rubber erasers), and some scissors. 2. 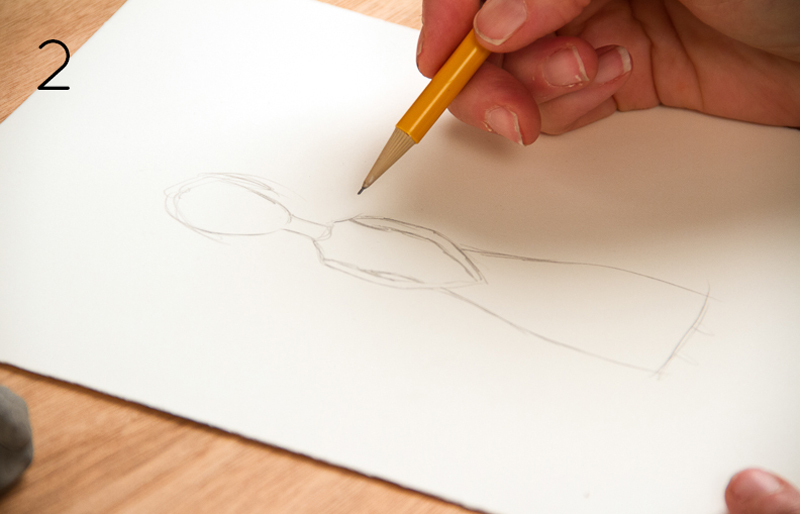 Lightly sketch in an outline of your doll with your pencil. 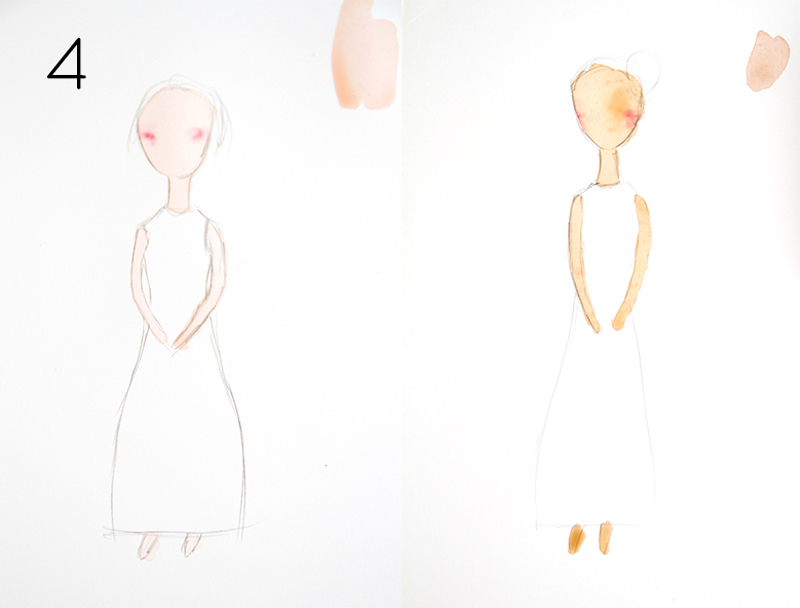 Keep your doll shape simple and try not to worry about exact proportions (sometimes the most charming characters emerge when we let go of perfection!). Erase as necessary. 3. 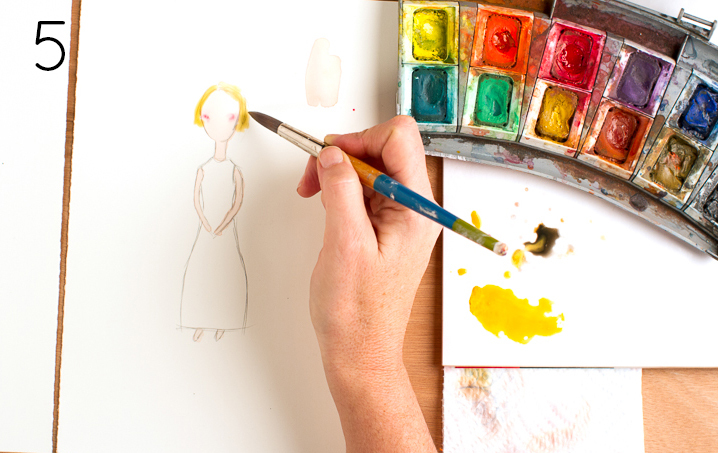 Using lots of water, mix up a “skin” color, and paint the face, arms and feet. (Note: I like to keep the arms close to the body, so that when she’s cut out, her arms are secured.) Optional step: When face part has had a chance to dry a bit, “dot” some red watercolor into the cheek area quickly. 4. If you would like a darker-skinned doll, repeat step 3 after the first layer is completely dry. 5. When face area is dry, add hair and let dry completely. 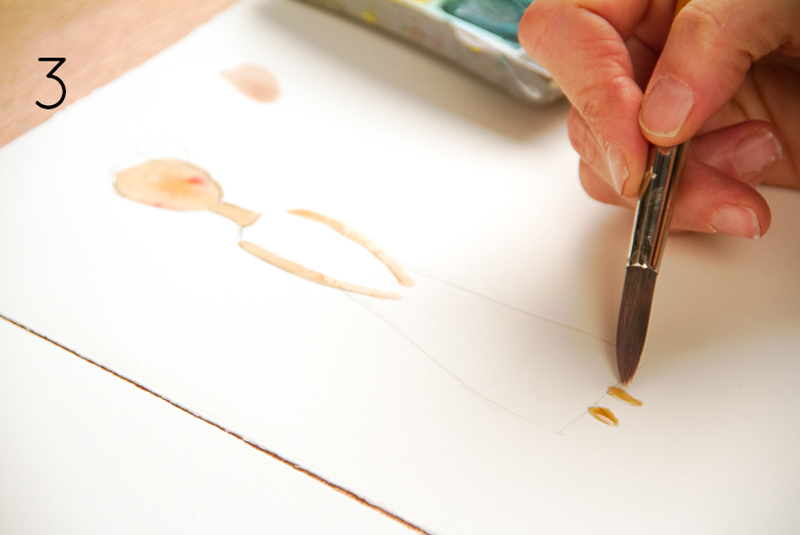 Darken your pencil lines and add facial features. Optional: Spray with fixative. 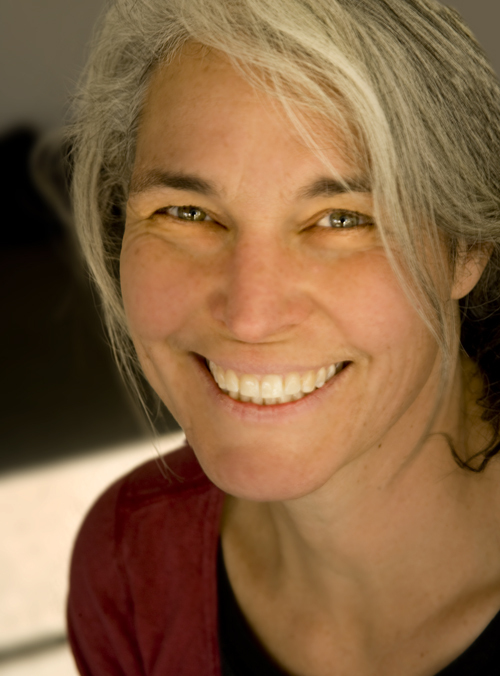 Carla Sonheim is a painter, illustrator, and online art instructor known for using innovative techniques to help students of all levels embrace a playful approach to creating art. She is also the author of the “Drawing Lab for Mixed Media Artists: 52 Creative Exercises to Make Drawing Fun.” Carla’s paintings have been showcased in many galleries nationwide, as well as private and corporate collections. For the last three years her focus has been on creating engaging online art classes, where she teaches and also presents well-known guest artists. Great tutorial, my daughter would love to do this fun and easy crafts. I also needed to try it in my spare time as I’m also curious if I have some hidden talent (lol!). I think it’s super fun to play with papers. Thank you to Carla Sonheim for sharing this to us. 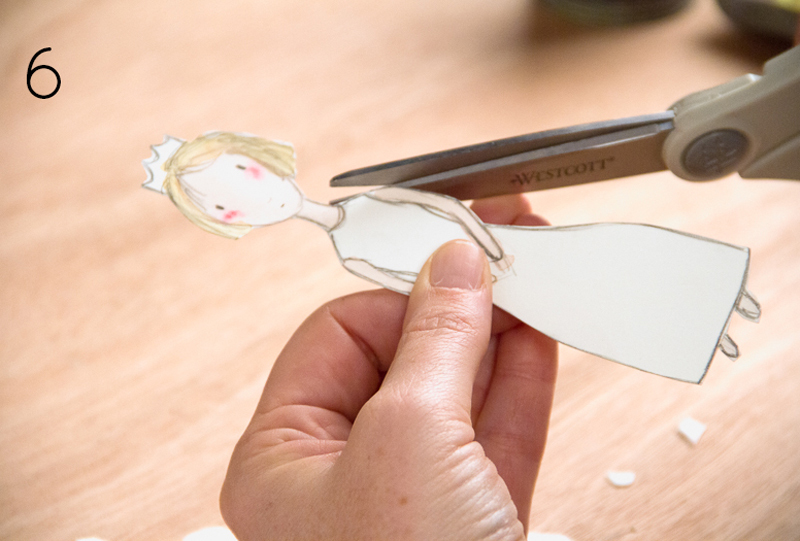 I love all your paper art work, you just make paper dolls so much easy and enjoyable, hope I can do that as well!